You may have trekked the red bricks of the Freedom Trail but you didn't get the whole story. Sure, the 16 historic sights you visited told you a big part of American History. But decades of Bostonians and their claims to fame spread far beyond that two-and-a-half-mile jaunt. So take a lesson from Robert Frost and try the road less traveled. It is one peppered with Boston's more recent past. And one that proves that while we may sometimes take our freedoms for granted, those in Beantown are proud of their past-especially the parts that include baseball, donuts or beer. 8 Smith Court, 617-725-0022. It's the oldest black church edifice still standing in the U.S., but most importantly, the African Meeting House represents a long history of struggle and achievement within the African-American community in Boston and beyond. Once called the black Faneuil Hall, it's where William Lloyd Garrison founded the New England Anti-Slavery Society. While at the Meeting House, visit the nearby Smith Court Residences and Abiel Smith School. All three destinations are stops on the Black Heritage Trail and offer a rare glimpse at African- American life in Boston during the 1800s. 193 Salem St., 617-523-6676. The Old North Church may be stop on the Freedom Trail, but the legendary landmark holds secrets aplenty. Once you've heard the tales of Mr. Revere, ask for a behind-the-scenes glimpse that brings you through century-old crypts including the grave of the first commanding officer of the U.S.S. Constitution. At least one body resting there wished it were resting somewhere else. British Major John Pitcairn, killed in the Battle of Bunker Hill, was meant to be sent back to England for burial. A mistake caused someone else's body to be sent in his place. And the church that once held Paul Revere's lanterns also houses the oldest church bells in North America. Originally cast in Gloucester, England in 1744, the bells were restored in 1975 and have rung regularly ever since. 159 Brattle St., Cambridge, 617-547-4252. Built in 1685 by Dr. Richard Hooper, a budding Boston-area socialite, this house is believed by many historians to be the oldest house in Cambridge. It incorporates an eclectic mix of architectural styles from more than three centuries of renovations, restorations and preservation attempts, making it a marvel of period-unspecific decor. 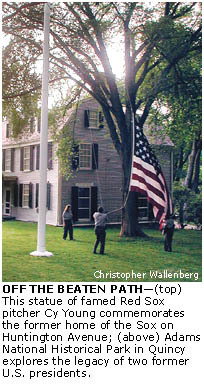 Today it is the headquarters of the Cambridge Historical Society, an organization that during the summer provides tours of the house and leads walks down Tory Row-a Revolutionary War-era segment of Brattle Street that includes the Harvard University President's house. 314 Commonwealth Ave. Suckers for the gaudy and grotesque will find it difficult not to ogle at the many-faceted (over 160 facets, to be specific) dimensions of this century-old mansion. Its charm lies in the nearly 50 dragons and gargoyles, 30 cherubs, 300 bibliophiles, and lion, eagle, and human heads carved into the elaborate stonework outside the building. 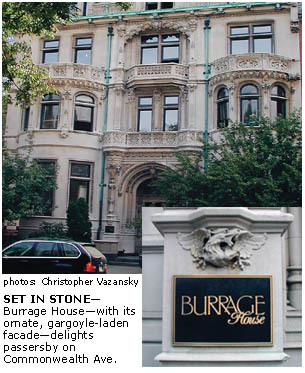 Once the strikingly ornate home of Albert Cameron Burrage, the mansion is now an assisted-living community. Take a walk or a short T ride from downtown, perch yourself on the curb, and dare to wonder at this French Renaissance-style funhouse. 1250 Hancock St., Quincy, 617-770-1175. The birthplace of both John Adams and John Quincy Adams, this National Park houses a compact history of one of America's most notable founding families. Visit the Old House where four generations of Adams families resided or explore the crypts where both presidents and first ladies are buried. Guided tours of the 11 historic structures and 14 acres of natural beauty are available from April 19 through November 10. Recreational activities, educational programs, and family-oriented events are planned throughout the year. 83 Beals St. (off Harvard Ave.), Brookline, 617-566-7937. Though most Americans fondly remember the days when JFK and his young family romped around the White House and the Hyannis shores, many forget the Kennedy's more humble beginnings in suburban Brookline. The green and yellow three-story house where JFK was born is simple and unpretentious, inviting visitors to explore its historical significance with only a small plaque and a gas lamp. Inside and out, the house remains remarkably similar to when the Kennedy family lived there in the early 20th century. On display are family artifacts such as a christening dress worn by his sisters, medical and growth-charting cards mother Rose kept for the children and a grand piano. Open March through November. Tours are available. 185 Franklin St., Verizon Building, 617-743-4747. "Mr. Watson, come here. I want you to see what my lab looks like." Okay, that's not exactly what Alexander Graham Bell said when he placed the first phone call ever, right here in Boston. But you can see a re-creation of the attic laboratory where the first working telephone was developed. Also displayed are Bell's original workbench along with several manuscripts, sketches and the prototype of the first telephone. Free and open to the public 24 hours a day. Charlestown Navy Yard, 617-242-5601. Right by "Old Ironsides" is what you might call 'Young Ironsides.' This is by no means an official name for the U.S.S. Cassin Young, but this World War II Destroyer represents the modern face of the Navy's workhorse ships. While the wooden U.S.S. Constitution got its nickname from its unusual ability to withstand attack, the Cassin Young was specifically designed this way. Be it torpedos, gunfire or kamikaze attack, ships like the Cassin Young were expected to handle it all. During WWII, the Cassin Young withstood two kamikaze attacks and thwarted nine others. Today, she is a memorial to the destroyermen and the ships they served on. Boston Public Library, Copley Square, 617-536-5400, ext. 4236. Most grandparents remember the controversy and high level of publicity that plagued the Boston-based trials of Italian immigrants and anarchists Nicola Sacco and Bartolomeo Vanzetti in the early part of the century. The men were sentenced to death for robbery and murder in 1927 and even after a controversial legal battle, many Americans still questioned the democratic process and showed lapsing faith in the justice system. The BPL collection includes original letters between Sacco and Vanzetti, manuscripts, Defense Committee papers, publicity scrapbooks, photos, placards, the death masks and more, ultimately detailing one of the most infamous trials in American history this side of O.J. 543 Southern Artery, Quincy, 617-472-9505. Satisfy your inner Homer Simpson by taking a snack break at the ultimate donut place. Dunkin' Donuts has become a cultural institution with over 5,000 stores in the United States and 40 other countries, including Peru, Guatemala, Bulgaria and Thailand. However, few people know that the first Dunkin' Donuts opened in 1950 in Quincy, Massachusetts, half a mile from the Quincy Center stop on the T's Red Line. Within a dozen years the company was celebrating the opening of its 100th store. Today they sell enough donuts each year to circle the earth twice. Even Homer should be happy with that. 30 Germania St., Jamaica Plain, 617-522-9080. Not just loyal Bostonians, but beer lovers of all stripes will agree that it doesn't get much better than paying $1 to taste quality beer on a tour of one of America's most celebrated breweries. In 1985, Jim Koch returned to the family business and revolutionized the American beer industry with the introduction of Samuel Adams Boston Lager. The craft-brewed creation sparked the microbrew renaissance that led to opening of other local breweries like Tremont and Harpoon. The facility, now used for research and development, boasts a storied history. It was once home to Haffenreffer Brewery and the original Boston Beer Company, which for years was the oldest brewery in America. Ocean Drive, Revere, 781-286-8190. 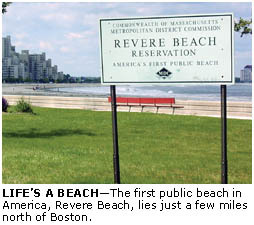 Revere Beach is America's first public beach and in its heyday gave even Coney Island a run for its money. Long gone are Bluebeard's Funhouse, Wonderland Park (which some say was the inspiration behind Disney World), Moorish Castle, and the area's famed ballrooms that once hosted a star-studded lineup of musical acts. But one can still enjoy a panoramic and picturesque view of Massachusetts Bay with lighthouses and ships at sea adorning the horizon, or take a swim along the sandy shores. 285 Babcock St., 617-353-4632. The Sox might have Derek Lowe and Pedro Martinez now, but in 1948 Bostonians city-wide were bowing at the feet of the one-two punch of Boston Braves' starters Warren Spahn and Johnny Sain. The pair did what this year's dynamic duo couldn't and led their team to a pennant win. Today, their stomping ground is covered with Astroturf but portions of the field, now home to Boston University sports, still retain aspects of the former structure-including a grandstand with the original right-field bleacher seats. The area was also the site of three World Series and the longest baseball game ever played (26 innings). So go on, get out in front of those college students and yell "Spahn and Sain and pray for rain!" We dare you. 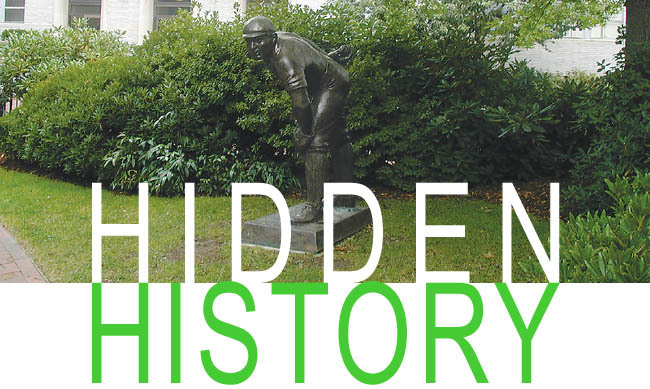 400 Huntington Ave. About three miles south of Nickerson Field is the site of another piece of Boston's baseball history. The Boston Pilgrims' Field has been covered over with Northeastern University's Cabot Center, but visitors can still stand on the spot where baseball legend Cy Young pitched the first perfect game of the modern era. The area also marks the site of the first modern World Series match-up between the American League champion Boston Pilgrims (later re-named the Red Sox) and the National League champion Pittsburgh Pirates in 1903. The statue of Young stands on what was the original pitcher's mound and the World Series Exhibit Room in Cabot Cage houses mementos from the pre-Fenway era. Sarah Buckley, Inna Golovatch and Meredith Pitts contributed to this article.